why wouldn’t you go to Kentucky? The two missing positions, you’ll notice, are point guard and power forward. At point guard, it’s not clear whether this year’s starter, Marquis Teague, will enter the draft, and even if he does, Calipari has Ryan Harrow, a quality NC State transfer, ready to take the reins. And now for the scary(er) part; at power forward, Kentucky is still in the running for Anthony Bennett, the top recruit at his position in the country, and Amile Jefferson, ranked fourth among power forwards. Bennett is essentially down to Florida or Kentucky, while Jefferson is choosing between Duke, Kentucky, and NC State. But considering the Blue Devils’ inability to land quality big men in the past decade, his choice will likely come down to the Wildcats and Wolfpack, and might depend on what move Bennett makes. So Calipari’s doing jusssst fine. Even if he didn’t work tirelessly to keep the elite talent coming, his reputation would precede itself. But he hustles, and until he becomes complacent, the recruiting landscape probably won’t change. Jason Jordan wrote a fascinating article this morning from the Jordan Brand Classic, and talked to several top recruits, who opened up about their decision-making process. The whole thing is worth your time, but the comments from the Kentucky guys are particularly fascinating. Goodwin said he had wanted to play for Calipari since ninth grade, and there was nothing Kansas’s Bill Self — Bill friggin’ Self — could have done to change his mind. Poythress sounded like he felt a closer connection to Vanderbilt, but it didn’t matter in the end because his gut said Kentucky. Noels, who had previously said that his mom’s opinion was the most important thing, essentially ignored the fact that she loved Georgetown and chose Kentucky instead. So how do you beat Calipari? A sterling reputation and dogged recruiting? No. An emotional bond between player and school? No. Getting to the player through his family members? Again, no. 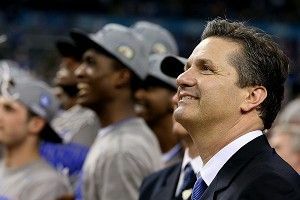 In fact, when you look at the players Calipari offered but didn’t get, his “failures” can be chalked up to one of two reasons, and both are out of his control. One, there was a better player at that position coming to Kentucky. Two, the player decided to stay close to home. The apparent lesson for other coaches here is to be located in the general vicinity of awesome players, or go after Calipari’s table scraps. Got it? None of this guarantees a national championship, of course. Of Calipari’s three previous top-ranked classes at Kentucky, only last year’s squad won their final game. But as his reputation continues to grow, it’s only going to get harder for everyone else. The 2012 title shot him out into the recruiting stratosphere, and the king will stay the king as long as he wants the crown.